Back in the early days of Gabe’s recovery—as in the initial two weeks—Anthony Maietta came to visit Gabe in the ICU of SF General. He is Gabe’s best and closest friend, buddies since age three. They’ve cavorted around the nooks and crannies of North Road in Winterport and pedaled to middle school nine miles away. Gabe was a groomsman at Anthony’s wedding last year. Aside from carrying the best friend title, Anthony builds custom bicycles, straight outta the heart of New England under the name MAIETTA. For those who haven’t heard the whisperings yet, we’re aiming for a certain rehab hospital in the New England area and upon hearing this, Anthony elected to donate materials and labor to host a raffle and build a bike for one very lucky ticket holder. 100% proceeds will go to bringing Gabe back to the East Coast on a very expensive and medically-required air ambulance flight. Read the full details at the Get Better Gabe website. 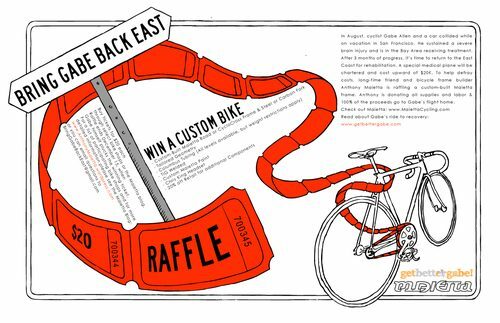 A great chance to help an amazing person out and win a beautiful bike.